...90x45mm pine battens were screwed into the box beams on the ceiling, supporting the structure. 75x19mm pieces of pine were attached at an angle to the battens so that they run vertically and a small chock of wood was added to brace them onto the rail brackets. The weather boards were nailed onto these mini studs. I added some extra support in between the curtain rail brackets using metal bracing off-cuts. I added a plain pine cornice and oiled and varnished the lot, so that it ties in with the rest of the room. 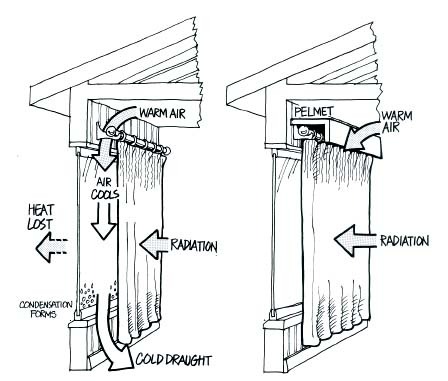 The diagram below shows how the pelmet prevents convection currents in winter, during summer our eaves do most of the work by preventing any sun from hitting the north (sunward) facing windows. 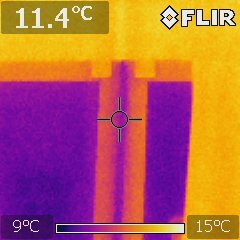 Sun reflection off the decking and the external temperature transfer heat through the glass during summer. 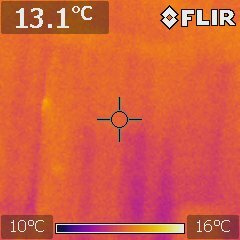 We close the curtains on really hot days, keeping the room dark and reducing the heat transfer as the hot air gets trapped between the curtain and the pelmet, unable to continue to rise up. Gaps at the edges of the curtains reduces the effectiveness of this though. Extra external shading would be better, but I have been reluctant to install sails as everyone that I know that has them does not take them down during winter. Options of easily removable shading or decidous plants are more appealing, but I haven't quite figured the best way to do that yet. I was contacted by a teacher who was running the 'Home Sustainability Course' at Seymour's Go TAFE. She asked if she could take her group to tour our home during mid winter, and I was happy to oblige. 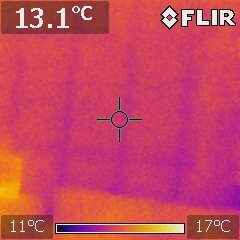 As a bonus, one of the teachers that joined the group was an energy assessor who brought along his thermal camera. Wayne took some around the living room that show the effectiveness of curtains with pelmets in regulating temperature extremes and how aluminimum and single glazed glass act as thermal conductors. 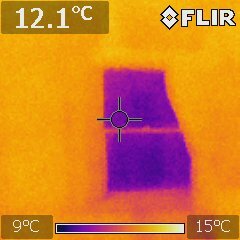 Thermal shot of west wall showing timber studs acting as thermal conductors, not as dramatic as aluminium or glass though. I already knew all that stuff...in theory...but those photos really prove it! How great are they? The pelmet will work...but it looks great too. Well done. Great pelmet! I'm building some too but mine won't have to be so strong. Regarding extra external shading, I'm not sure if that's what you meant, but these people sent me a free kit to test and write about after I saw it reviewed very favourably elsewhere. I'm sure I saw the same product in Australia under a different name. They sell the snaps separately, so I plan to buy some and use nursery shade cloth for my other windows. methinks the oil tin drawers will have cutting sharp edges. your comment?